Passion is something which motivates a person to dedicate for a cause. History is witness to it that such people devoted their lives for some cause. In this age of frustration and greed, it is very difficult to find such people but when I met Abdul Sami Memon, I realized that few phenomenons never end. Abdul Sami Memon born on 15th January, 1957, did his matriculation from Municipal High School Hussainabad, Hyderabad later graduated from Commerce College Hyderabad. He is presently working as an Accounts Officer in WAPDA. The passion of this man was Table Tennis. He with his utmost commitment has given thirty years of his life to the world's fastest game and produced more than twenty good players from Hyderabad. 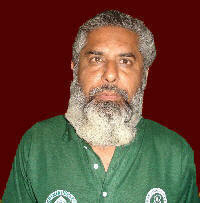 Sami is now a senior coach as well as honorary President of Hyderabad Table Tennis Association. Q: Would you please like to share that when and how your interest developed in this game? Ans: It was back in 70's when one of my friend took me to a club that used to be at Wahdat colony and people used to play Table Tennis there. I played there for the first time and was unable to control the ball on the table. I kept on coming and tried to play but it was very hard for me, however I did not leave it. I took it as a challenge and time came when I stood as runner up in the Inter School Table Tennis Championship held in 1974. That's how the interest developed and I got into this game. Q: When did you formally started coaching? Ans: I started coaching in a club at WAPDA in 1980's and my first student was Javed Memon, who by his hard work and good skills made his entry in the national team and represented Hyderabad division in the national events. Q: Did you get any coaching or training course before you started coaching players? Q: Three of your students and players represented Pakistan in International Table Tennis Championships, would you like to tell a bit about them? Ans: Yes, three of my very fine students made me proud by representing not only Sindh and Hyderabad but also Pakistan in the international tournaments. One of my students Haleem Ahmad Memon played in Junior Asian Table Tennis Championship held at Goa city of India in 1997, a girl Shagufta and a boy Syed Awais Ahmad represented the country in Junior SAF Games held at Dhaka city of Bangladesh in 2004-05. Awais also represented Pakistan in All World Inter-University Table Tennis Championship held at Bankok. Q: How many international tournaments you did umpiring? Ans: I went for two international events as manager of Pakistani team, once for India in 2006 and once for Iran in 2008. I did umpiring in SAF Games held at Islamabad in 2004 and again in SAF Junior Table Tennis Championship held at Karachi in 2007. Q: Despite of having strong background in this game, why now Table Tennis has vanished from Sindh and especially from Hyderabad? Ans: Well! There are multiple reasons behind the extinction of Table Tennis from Hyderabad. One of the major reasons is that now there is lot of internal politics in the Association and Bodies which are made to manage the game. Secondly, there is not much support from government side. In Hyderabad there is only one Table Tennis Club at Niaz Stadium and that too is ruined because of ignorance by the authorities. In early days, the schools and colleges used to be a nursery for players but now schools and colleges do not take much interest in this game. So neither do parents of children motivate them for such a healthy indoor game. They do involve them in cell phones and internet but never ask them to have such healthy activities. Other than these problems, now days, load shedding, mobile snatching, street crimes and universal insecurity have badly affected the growth of game and players. These are few reasons because of which we are lacking behind. I personally give as much time as I can but I don't get that output which I used to get in previous times. Q: What was the Golden era of Hyderabad in the field of Table Tennis? Ans: The span of 2000 to 2005 was really a golden period for Hyderabad because in this duration, the players of Hyderabad gave us recognition through out the country by winning All Pakistan Inter-Board, Inter-University and Junior National Table Tennis Championship. Q: Are you satisfied with your efforts towards Table Tennis? Ans: I feel that I gave away my life which I could have enjoyed easily with my family and children but I preferred it to be utilized for a cause. Table Tennis gave me some wonderful students and friends. I am satisfied because I not only made players but I also made some successful persons as many of my students got admission at University of Sindh, Karachi University and NED University on sports quota.